During President Obama's visit to China, both countries announced a new climate change agreement that effectively takes away one of the right wing's major arguments against action to curb global warming. For the first time, China has agreed to set a limit on the amount of greenhouse gases it will emit by 2030, increasing its reliance on renewable energy. This is significant for two reasons-one, China is now the largest emitter of carbon dioxide emissions in the world, and two, the US government and conservatives have used China's previous unwillingness to set such limits as an excuse to avoid any and all binding targets on U.S. emissions. The U.S., as part of this agreement, sets ambitious goals for reductions in carbon pollution by 2025. The bilateral agreement is also significant because it comes in advance of UN sponsored climate talks in Paris in the fall of 2015, aimed at forging a binding international treaty on climate change. Bill McKibben, founder of 350.org, notes both the historic nature of the agreement and also its limitations, in his commentary on Huffington Post. He points out that this agreement comes barely more than a month after the giant People's Climate March in New York City on Sept. 21. 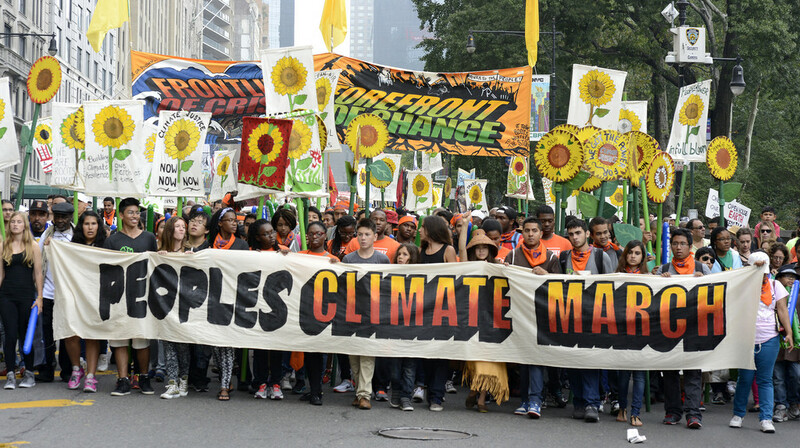 This massive outpouring set the pace for the upcoming struggles over environmental issues. He also notes that this agreement by itself is no reason to slow down or stop the mass struggle for more aggressive climate action. And have no doubt that there will bee sharp struggles. Mitch McConnell, the likely new Senate majority leader in 2015, has already announced that he opposes the new deal; that he will oppose the efforts of the EPA to regulate new and existing power plant carbon pollution and that he places a high priority on Congress passing legislation to approve the Keystone XL pipeline. Some Democrats propose a vote to approve the Keystone pipeline during the lame duck session to boost the chances of Mary Landrieu winning re-election to the Senate from Louisiana. The battles over climate change and other environmental issues will play a larger role in electoral and legislative struggles, and we can already see glimpses of splits in the ruling class. A new study confirms that the opposition by conservatives is not some kind of general rejection of science, it is a reaction against the steps needed to find solutions. That reinforces the points made author Naomi Klein in her new book, "This Changes Everything" that right-wing politicians recognize climate change as being a challenge to the capitalist system. The new agreement will only escalate the intensity of right-wing opposition to any and all steps to tackle climate change, greenhouse gas emissions, and all forms of carbon pollution. But it offers renewed hope for a serious international agreement to replace the expired Kyoto Accords. This article was originally published in People's World by Marc Brodine.